I will be speaking to the Cape St Claire Garden Club, Tuesday, June 6th at 7:00 p.m., at Cape St Claire Clubhouse, 1223 River Bay Road, Annapolis, MD, 21409. 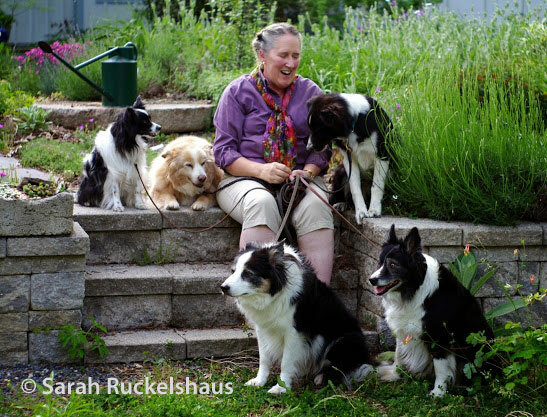 The public is invited, and I hope some Eastern Shore Gardener readers can join us! A couple of days ago I was returning from running errands, and spotted a family of turkeys in our yard. They were strolling through a group of trees along the driveway that I hope one day will resemble a woods. As they slipped into the tangle of vegetation, it reminded me how much progress I’ve made over the years replacing lwangrass with more wildlife-friendly plantings. This woodsy area is still far from beautiful, but it does now host a variety of native trees and shrubs that I have planted over the years. In the interest of full disclosure, it is also the site of one of my major wineberry battles earlier this summer. I keep a list of birds I have spotted on the property, and this isn’t the first time I have seen turkeys here. (In addition to being a gardener, I am a birder, so I am usually always looking.) Still, it has been fun to follow this family all summer and plan what else I can add to the landscape that will make it friendlier to an even wider variety of creatures. Above: Yellow-Billed Cuckoo, one of the many species spotted at Hackberry Point. Come September, I will certainly add more natives for birds and other wildlife, and I hope many other Eastern Shore Gardeners will do the same. 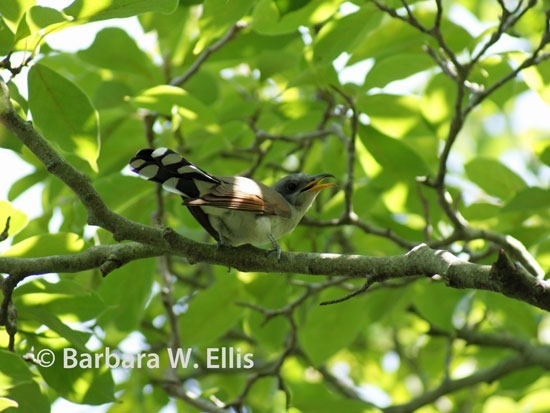 To help get you planning and planting, I wanted to share a link to 10 Tips for Attracting Birds to Your Landscape, a blog post I wrote for the University of North Carolina Press in support of Chesapeake Gardening & Landscaping earlier this year. I hope you enjoy it! Despite the fact that we have been living here since 2004, I am happy to report that there are still botanical surprises at Hackberry Point. Over the weekend David Arnold, who is helping me in the garden this year, left a cutting and a brief note on my doorstep. “Barbara, What is it? David.” I could tell right away that the plant was a member of the pea family, Fabaceae, but beyond that, it wasn’t familiar. Furthermore, I was astounded that I hadn’t seen it first, and I had to call him back to find out where the plant was growing. It turns out it was along the edge of the creek, just next to where our dock extends out over the water. After taking some pictures, I delved into my native plant books. I finally found a cool on-line key to pea family plants that helped me identify it. 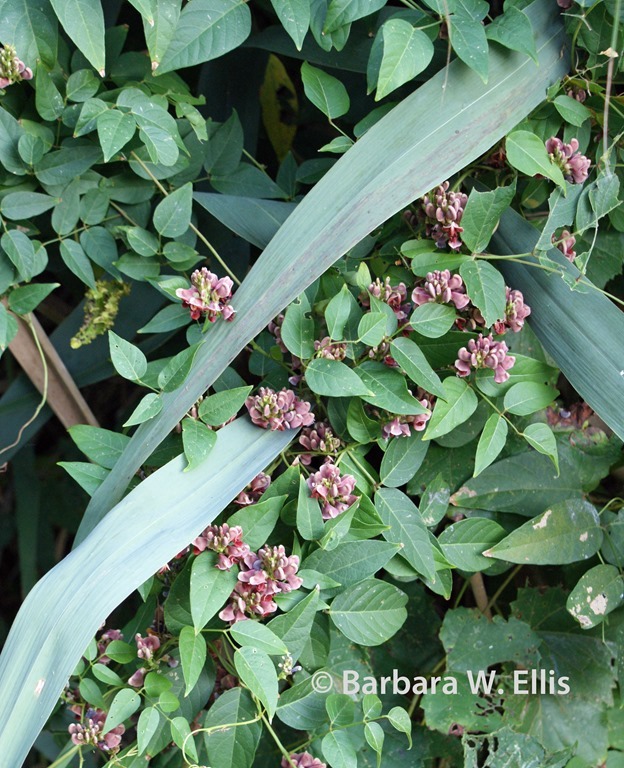 I determined that my new native plant was Apios americana, commonly called groundnut or potato bean. 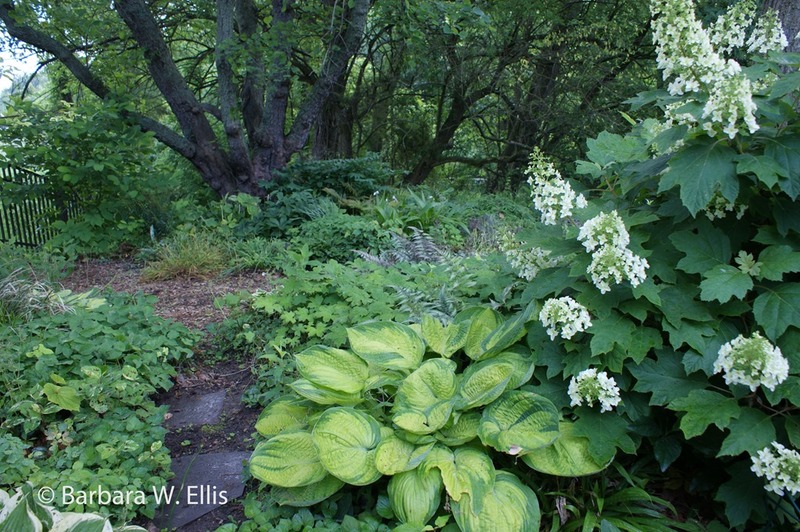 The plants prefer sites with wet soil, which explains their location along the creek. Since I walk by the site frequently to go out onto the dock, I can’t imagine how I missed them in previous years, especially since they produce flowers in August. 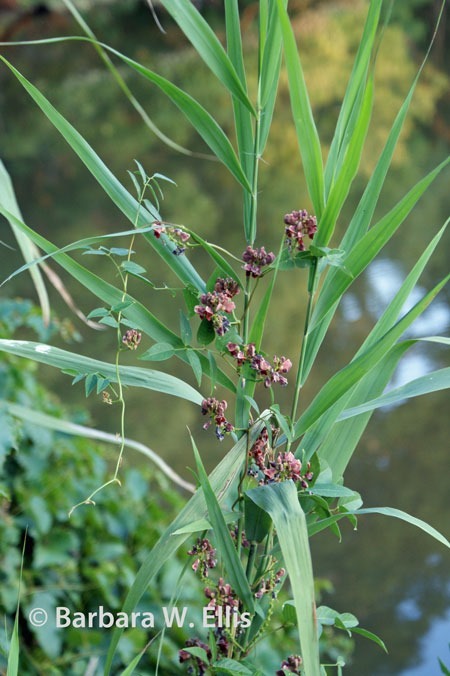 I wonder if tubers or seeds floated in from somewhere else and this year for the first time the vines conquered the tangle of grapes, phragmites, and shrubs at the water’s edge. Groundnut grows from edible tubers, and were an important source of food for native Americans and early settlers. Since tubers form slowly, they haven’t become a popular cultivated crop. For more information on ground nuts, Orion Magazine posted an excellent article by Tamara Dean. For a more detailed botanical description, see the page on this species in Climbers. Groundnuts also aren’t popular garden plants because they are too rampant for most garden situations. Mine seem to be happy competing side-by-side with thugs like phragmites. I’ll continue to look for more spots in the wild garden where I could plant them. While I doubt I’ll be able to find tubers because of the density of the plantings along the creek, I do plan to save seed this fall. E-mail me privately if you are interested in getting seed to start your own patch. I was honored to be asked to do a video interview about Chesapeake Gardening & Landscaping, for The Chestertown Spy. Here it is for readers who don’t get the Spy. Below, I’ve added a photo that illustrates one my other overwhelming interests! Above: Front row: Bienn and Bonnie. Back row: Bing, Casey, Me, and puppy Charlie. 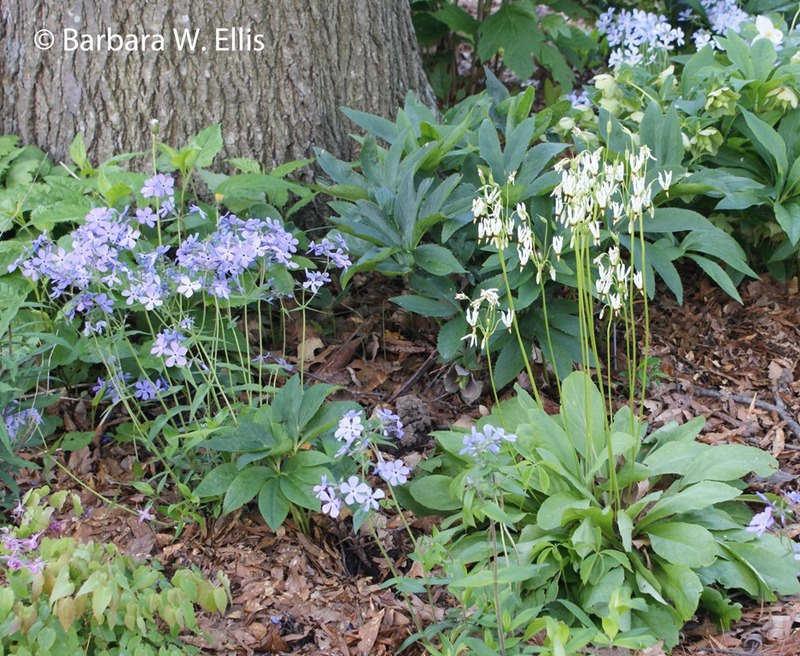 I hope some readers of Eastern Shore Gardener will join me at Adkins Arboretum this Friday or Saturday. Adkins is celebrating the opening day for their native plant nursery, and I’ll be there to sign copies of Chesapeake Gardening & Landscaping. There’s little doubt I’ll be buying some plants as well. I will be signing books on both Friday and Saturday from 10:00 a.m. to 1:00 p.m. Bring questions, too, and I will do my best to answer them! 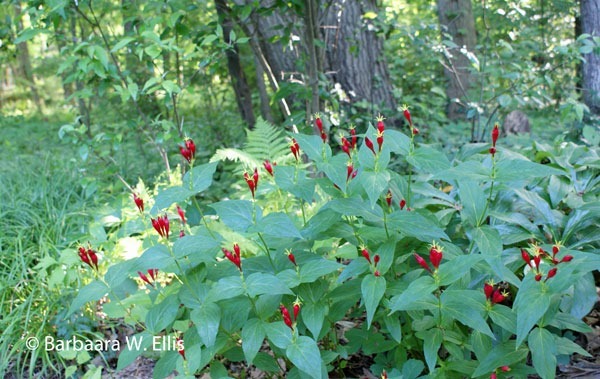 For more on the event see Native Plant Nursery Opening.